Connilyn Cossette is one of my favourite authors her books never fail to hold me spellbound. Shelter of the Most High is no exception. If you want to transport yourself in to the Old Testament, to one of the Refuge Cities with beloved characters don't pass up this book. It is full suspense, romance, fierce loyalty, revenge, all woven together to show you a glimpse of what happened in the first years of the Israelites moving in to the promised land. This book makes me love God more which is such a bonus, you get to read a wonderful novel and along with that joy you come closer to the God you love. A book not to be missed by Christians and non-christians you will all love it. 5.0 out of 5 starsCouldn't stop turning the pages! Connilyn Cossette never fails to deliver a riveting story, and each book she releases sees her more firmly entrenched on my ‘must read authors’ list. Not only are her stories fantastic reads, but I always come away from them feeling like I’ve gained new insight into the Old Testament, whether that be a better understanding of the cultural context or the way in which the Israelite laws and customs point forward to Christ. 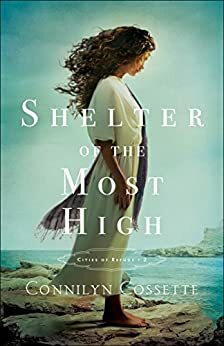 It’s been fascinating learning about the Cities of Refuge through this series, especially since they’re only mentioned briefly in the Bible, but even more fascinating in this particular story was learning about the Israelites’ laws and customs from the perspective of an outsider—and the daughter of a pagan high priest, at that. It’s so easy to look at the Old Testament laws from our 21st Century perspective and write them off as harsh and barbaric, but seeing them through Sofea’s eyes gives you a whole new perspective, bringing out the compassion and mercy that balances God’s justice. Not only are the historical details fantastic, but it’s impossible not to become emotionally invested in the characters’ lives. Compelling personal struggles, delicious romantic tension, and high-stakes suspense just begged me to keep turning the pages, and I very happily complied. Connilynn Cossette does it again, bringing to life little-known nations, people, and situations of Scripture, in her second Cities of Refuge novel. This time, she pairs aspiring Hebrew soldier Eitan with Sofea, a high priestess' daughter from the ancient island of Sicily (Sofea is known as a Sicani). It takes awhile for sparks to fly, but in the meantime, Connilynn crafts a story rich in character, historical grounding, and spirituality. Our two protagonists make a great couple, but shine as separate people, too. I usually get more invested in the hero or heroine, but Eitan and Sofea both kept my attention with their stories, needs, desires, and character arcs. Sofea is particularly interesting because she's a captive, but not of Israel, and because she didn't become a captive in a usual or traditional way. Meanwhile, readers get a rich update on how Eitan's life has gone since we last saw him as a boy of nine, exiled to Kedesh when his adoptive mother was convicted of manslaughter. Like any good hero, he managed to incite my sympathy and empathy while maintaining a strong, protective, and manly persona. The secondary characters make up a rich and multifaceted cast, too. Everyone from Moriyah and Darek to Nadir, from Binah to even little Abra and Chana, feel real and like people you want to spend time with, even if sometimes their actions and motives are reprehensible. (Connilynn has always been able to craft three-dimensional villains along with her heroes, and the one in Shelter of the Most High is perhaps one of her best examples). Once again, ancient Israel is painted with a deft and well-researched brush, bringing the settings of Scripture to life. Once again, Connilynn also nails the spiritual arc, often through the unexpected voice of Sofea's introverted cousin Prezi. You think you know where Prezi's story in particular is going to end, but Connilynn had a believable, yet gratifying surprise up her sleeve. Seeing Sofea learn to embrace Yahweh after growing up with a brutal high priest for a father was one of my favorite parts. Meanwhile, Eitan undergoes serious spiritual growth of his own; his scene at the altar is perfect for his story and motivations. Some parts felt a bit slow, but that might be because I had been so eager to read this that I purposely didn't take in very much at one time. It may also be hard to keep up with who is who if you haven't read Connilynn's other series or if it's been awhile. Overall though, Connilynn crafts another beautiful book. The conclusion of this series should be awesome, and I can't wait for more. Since the release of her very first novel Connilyn Cossette’s stories have been favorites of mine and some of my most looked forward to each year. The old testament comes to life through her writing and her research always stands out to me. I will always find interesting historical tidbits that have me scouring the internet for more information. Pirates of the ancient world? That is more than enough to pique my interest. Sofea and her cousin Prezi enjoy nothing more than swimming in the seas of their native island of Sicily. Then in one brief, violent moment they lose all they have ever known and find themselves in a strange land where they are unable to communicate with the people around them. The idea of being so far from home, grieving and afraid, without even the basic comfort of speaking to those around you really struck me. Eitan will be a familiar face to those who have read A Light on the Hill. The demons of his past loom over his future, affecting his relationship with his father and his God. He chafes at the confinement of Kedesh’s walls and longs to serve his nation as unrest in Canaan starts to simmer. I couldn’t put this book down and loved the conclusion even though the ending of a great book is always a little bittersweet. I look forward to Until the Mountains Fall and getting to know Rivka and Malakhi better. This sequel lived up to the potential of A Light on the Hill and I'm so glad! I loved getting to read more about Eitan, Moriyah, and Derek, and their family. Sofea, the heroine, was interesting and I thought it was neat she was from a Mediterranean island. The story kept me on my toes and I was not expecting the plot twists, so just like in the previous novel, I felt the story was fresh and not predictable. I definitely recommend, and I'll be looking forward to the third book.